Dr. Ross Trust & Nancy Ross Estate Auction - Kramer & Kramer, Inc. Dr. Ross Trust & Nancy Ross Estate Auction - Kramer & Kramer, Inc. ANTIQUE FURNITURE: Oak Curved Glass China Cabinet with Man of Mountain and Beveled Glass Mirror; White Clad Oak Two Door Ice Box with Paneled Sides; Poplar China Cabinet; Oak Hall Tree/Umbrella Stand with Gingerbread and Beveled Mirror; Slant Top Sugar Chest; Willett Cherry Four Piece Full Size Bedroom Suite-Includes Bed, Chest, Dresser, and Two Night Stands; Willett Cherry Full Size Bed; Arts and Crafts Coat Rack; Oak Adjustable Platform Rocker with Adjusting Foot Stool; Willett Cane Seat and Back Rocker; Four Bentwood Chairs; Two Heart Back Ice Cream Chairs; Chrome Base Square Table; MODERN FURNITURE: Maple Oak Queen Size Five Piece Bedroom Suite-Includes Bed, Night Stand, Triple Dresser, Chest, and Chifforobe; French Provincial Five Piece King Size Bedroom Suite; EA Maple Double Drop Leaf Table and Four Chairs; Mahogany Four Piece Pineapple Poster Bedroom Suite; Willett Solid Maple Three Piece Full Size Bedroom Suite; Keller EA China Hutch; Pecan Finish 6’ Lighted Curio Cabinet; Small Pine Five Drawer Chest of Drawers; Ethan Allen Homestead Rocker; Pair End Tables with Marblelite Top; Pair Dough Box End Tables; Overstuffed Furniture; OUSTSTANDING GENTLEMAN’S RING: 14 Kt. 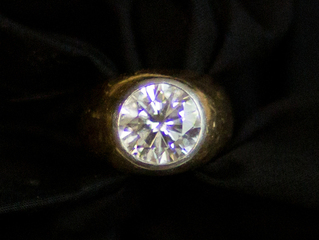 Yellow Gold Men’s Ring Bezel Set with a Round Brilliant Cut Diamond. The Ring Size is a 9 and Weighs 11.1 DWT, 8.01 Ct., SI1 Clarity and I-J Color Rating, Minor Dents and Scratches are present on the Ring; JEWELRY: 18Kt. Yellow Gold 36mm Rolex President Watch (1962); 14Kt. White Gold Diamond Earrings Set in a Three Prong “Martini” Style Mounting, 1.64ctw, I1 Clarity and Rated J in Color; 14Kt. White Gold Two Circular Brilliant Diamond and Taper Baguette “X” Pendant with Chain, Approx. 1.60 Ct. Wt. ; Vintage Ross Wrist Watch featuring a Platinum and Diamond Case with a Scroll Design and a 14K Bezel Set Diamond Bracelet, Total Diamond Weight is Approx. 1.56ctw; 14Kt. 16” Reversible White and Yellow Gold 4mm Domed Style Omega Necklace, Approx. Gold Weight 9.4 DWT; STERLING FLATWARE and ACCESSORIES: Gorham Melrose Flatware Five Place Setting Service for Twelve, less Two Spoons; A. Newsalt Service for Eight, less Four Pieces, Total of 70 Pieces; English Hallmarks Silver Coffee Serving Set; ANTIQUES-COLLECTIBLES: Shelf Clock; Several Quilts; Shell Penn One Quart Oil Bottle; Lionel Engine 2026; Asst. Train Cars; Doepke Mfg. Co. Inc. Rossmoyne, O. 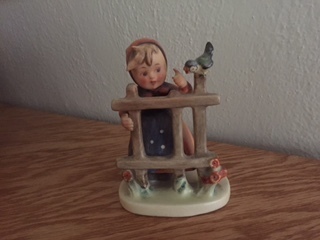 Ladder Truck; Monmouth Leaf Jug; Painted Child’s Hutch; Framed Fruit Player Boy Print; Blue and White Mottled Granite Pan; Plator Silverstone Spanish Goblets; Seven Piece Pewter Tea Set; Aluminum Apple Graduated Canister Set; Asst. Older Medical Books; Collected Papers of the Mayo Clinic 1949-1956; Costume Jewelry; Cookbooks; Twenty Willow Tree Figurines; Miniature Cat Collection; CHINA-GLASSWARE: Queen of France, Haviland Service for Twelve with Six Place Setting and Accessories; Noritake Progression Daisy Partial Ten Place Setting Dinnerware; Harkerware Service for Eight Dinnerware; Demitasse Set; Majolica Cup; Fiesta Ware; Pair Weller Vases; McCoy Pitchers and Vases; McCoy Bear, Chef, Clown Cookie Jars; Brush w-29 Cookie Jar Asst. Pressed Glass; HOUSEHOLD:Frigidaire Upright Smudge Proof Freezer; Black KitchenAid Side-by-Side Refrigerator (Freezer on Bottom); GE Washer and Dryer; Sony 40” Bravia Flat Screen TV; Singer Console Sewing Machine; Kenmore Elite Microwave; Kitchen Aid Mixer; Shark Rocket Sweeper; Countertop Appliances; Cutco Knives; Pots and Pans; Flatware; Kitchen Utensils; Metal Four Drawer File Cabinets; Bedding and Towels; FIREARMS; Remington, Model 721 30/06 Bolt Action Rifle; Remington Model 11, Semi Auto Shotgun; Savage Model 6A, .22 Cal. Tube Fed Semi Auto Rifle; Unlisted. AUCTION ORDER: BEGIN WITH SMALLS, 11:01 A.M. JEWELRY and STERLING, 11:00 A.M. 11:01 A.M. HUMMELS. 12:00 A.M. FURNITURE. EXPECT DOUBLE AUCTION RINGS. HAND TOOLS-LAWN and GARDEN ITEMS. TERMS: CASH OR PRE-APPROVED CHECK. LUNCH. This Auction is being Conducted by John Muncy & Associates (937-687-1919) with assistance by Kramer & Kramer, Inc.. Please feel free to Contact Either Company for further Information on this great Auction. Auctioneers: John Kramer, John Muncy, Matt Nixon and Michael Johnson.